We previously featured a Defender which was driven by the gentleman at the Charles Hurst parts desk known as Davey Craig. Since then, we discussed a few other options from the renowned stable that is Land Rover and decided that the all new and recently released Discovery Sport would be ideal for testing and so I got one for a weekend and as per usual got booked in with Walter at the amazing Ireland Off-Road Experience within Clandeboye Estate. As expected from Land Rover this is a premium 4×4 with a plethora of options and toys and indeed you would be forgiven for thinking that the Discovery Sport is the spawn of a one night stand between the Freelander (which has now ceased production) and the popular Range Rover Evoque. 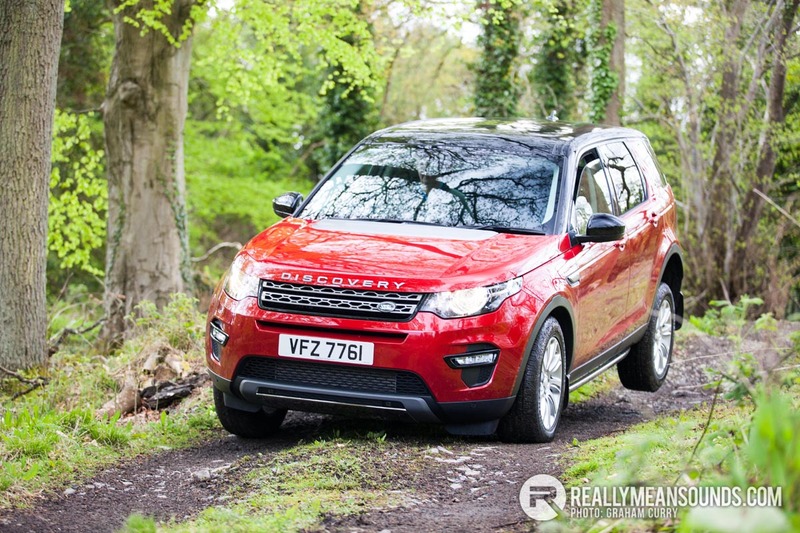 The Discovery Sport in my view replaces the Freelander however it is a lot more grown up and refined than the more practical Freelander work horse was. We drove an SE Tech model which gets front and rear parking sensors, touch screen media system with sat nav and powered tailgate to name a few things on top of the very good base spec, it was also fitted with optional chrome accessories on the front and rear bumpers as well as chrome side bars to protect the sills. Engine wise it had the 2.2 SD4 engine which produces just shy of 200bhp and a mountain of torque (310lb/ft) meaning it was never struggling on or off road and indeed with the optional “tow pack” allows a braked trailer weight of 2500kg which is respectable and would see a good sized boat or rally car being pulled along with legal ease. Consumption on mixed driving over a weekend was low 30’s which wasn’t as good as I had hoped for but better than some competitors in its class. Driving on the road was smooth but firm in regards to the lack of body and tyre roll, larger 4×4’s have come so far even in the last few years and they are driving more and more like cars for every model that is realised, thus meaning they handle well, are light to drive and respond well to city driving as well as coping fine when you’re in a rush on country lanes. They can absorb everything you throw at it with ease and when you have all the children dropped to school it is perfect to bring a filled soda up the mountain to your beloved who has been tending to a herd from first light. Off road there are several aids, the main being the “terrain response system” as found in the Evoque in which the driver selects between four different settings depending on the surface below, these are: General, Grass/Gravel/Snow, Mud/Ruts and Sand. The Sport then works out what it has to do with power delivery to keep you moving over whichever surface you are driving on. It also features hill decent control, gradient release control and roll stability control. The manual that we tested off road wasn’t overly keen on making it up the steep incline test which took some persuasion, but eventually made it and the other criticism of its off road ability would be the severe lack of ground clearance, when driven on rutted tracks the underside doesn’t really have much of a chance however on less rutted areas it was awesome. Inside the cabin and it is a genuinely nice place to be, at the height it’s a joy to get in and out of, it’s not too low nor too high, just nice and the seats are comfortable and reasonably supportive throughout, the back seats have a slide forward option and this is key for the plus side of this Land Rover. It has a five seat layout plus two in the boot which lift up creating two very cramped seats that would be suited for young children whilst still leaving enough room in the five usual seats for adults to be comfortable. The boot is mega and would easily see a couple of sets of golf clubs, a tool box with spare wheels or a couple of prams with accompanying bags that go with children of such ages. The model tested had a glass roof with electric blind and this created an illusion of size once the light came streaming through and made the large cabin even more spacious feeling. The dash was well laid out and the usual toys apply such as heated seats, Bluetooth, sat nav, front and rear heated screens, electric everything. Smart phones can be connected via USB to access Land Rover’s “in control apps” which turns the touch screen into dual screen to show certain apps including car parking, internet radio and sat nav apps as well as allowing the user to access calendar, contacts and music. All in all, a nice comfortable safe place to be that is best suited on road and drives brilliantly. Very smart baby Range Rover. Wouldn't be my colour choice, a met grey with a black roof would be lovely. LR have some line up! Oh and I notice you must be the estate's best customer @Graham! Nice axle articulation :P These things look great but seem to have strayed quite a bit from the 'tough as nails' discoveries of old. I guess that's the way the market is these days. My accountant has one in dark red and it looks great. Perfect for towing a boat etc on a long drive. Love that sat-nav interface - nice touch. Also nice to see a review where the thing gets used properly. When you have the next Landy out on test, I want to know how well and how fast it can pull a two cow, tri-axle trailer. | Love that sat-nav interface - nice touch. Also nice to see a review where the thing gets used properly. When you have the next Landy out on test, I want to know how well and how fast it can pull a two cow, tri-axle trailer.